Are you suffering from over diagnosis and over treatment? A recent editorial in the British Medical Journal (BMJ) last week (7 November 2014) talks about over treatment and over diagnosis and its dangerous fall out on patients. This is a topic very dear to my heart and I have been writing about it for decades even in the BMJ. Today, diagnosis has become a disease in itself. Doctors and their informed patients want to get a label for their illness. Doctors want to label their patients in this highly litigious society today to save their own skin against frivolous consumer claims. Patient anxiety, doctor worry and the corporate greed have all come together to over-investigate patients even with self-curing minor illness syndromes that form the bulk of patients. A very interesting case comes to mind. I was once an arbitrator in a civil case between an insurance company and a large philanthropic institution that had insured a whole village in their area. A healthy farmer got a small skin tear in his feet while ploughing his field. He went to a nearby hospital. When they found out that he had insurance cover they immediately admitted him for investigations. They used all their technology to do all tests on him only to find that they were normal. They then told him that they were planning to do skin grafting for quick healing; the poor farmer believed them. I was pleasantly surprised at his note and summoned him to come to me. He was worried that he had committed a serious blunder for which I might reprimand him. When he hesitatingly entered my room, I made him comfortable and congratulated him profusely for his scientific medical knowledge to save his company. I was curious to know as to how a layman could have access to such accurate medical knowledge? He was hesitant to answer my question in the beginning but later opened up to say that he was a qualified veterinary surgeon but was a failure in his practice and got this well paid job in the insurance company! This story tells us to what extent over-investigation and over diagnosis could go. Another area is cardiac revascularisation. Most, if not all, bypass and angioplasties are not indicated, but are done routinely. Anyone who goes for a cardiac check-up has a good chance of coming home, if he survives, with a stent in his heart! “Over diagnosis of the well and under treatment of the sick are the conjoint twins of modern medicine." So writes Iona Heath in an essay this week (doi:10.1136/bmj.g6123). She articulates the fears that drive medical excess: our existential fear of dying, and the ever present fear that a serious diagnosis will be missed. While striving for accurate diagnoses and appropriate treatment, Heath says that clinicians and patients need to acknowledge the limits of medicine and embrace the uncertainty that lies beyond. "Only because we do not understand everything and because we cannot control the future is it possible to live," she says. This is taken from last week’s BMJ editorial. More than all these that Heath has written, corporate greed and consequent doctors’ greed drive over investigations and over diagnosis. In the area of cardiac revascularisation the culprit is the coronary angiogram which has NO PLACE in the diagnosis of coronary artery disease. (BM Hegde: Bull. Royal Coll of Physicians of Edinburgh 1995; 25: 421) In fact, large blocks never kill. “Less than 30% of the infarct related vessels are more than 50% blocked” wrote Valentine Fuster, a diligent research in this area. Even young children have these coronary blocks all of which are intraluminal blocks (blocks inside the vessel lumen) (JAMA 1953; 152: 1090-1093).They are just “Band-Aids” to close the usual injuries to the intima of the coronary or any vessel wall. The killer plaques that attract a clot to produce an acute block (heart attack) in the vessel are inside the coronary vessel wall; the mural blocks, otherwise called the vulnerable plaque. The latter can never be seen in an angiogram. Their diagnosis depends on blood tests to unravel inflammation there and angioscopy which looks inside the vessel. The ONLY role that the coronary angiogram plays is when one decides that a given patient, based purely on his clinical status, needs bypass surgery for his intractable chest pain relief (when it cannot be relieved otherwise), the operating surgeon needs to have to study the coronary anatomy to know where and how to plumb. If we can put an end to coronary angiograms for the diagnosis of anginal pain millions will be saved from morbidity, adverse drug reactions (ADRs), and premature death. This was exactly the advice that my former chief, Nobel Laureate Bernard Lown, gave in his article in 1992 (JAMA 1992; 266: 754-757). Any re-vascularisation procedure demands lifelong blood thinner therapy. In Indian context this could be one of the major risks. Even aspirin in small doses “might or might not reduce non-fatal heart attacks, but will certainly increase the incidence of fatal haemorrhagic stroke.” At the end of the day people who are destined to die will die. We doctors are good at changing the label in their death certificates, from heart attack to brain attack, but not it’s DATE! Be that as it may, there are other compelling reasons why we should be avoiding over diagnosis and over treatment. Science is change and medical science has changed-naturally. With new physics we now know that the human mind is the human body. Our creating anxiety with a serious diagnosis is capable of advancing the death significantly. In systems biology today human body is a closed system, where our interventions might interfere with the body’s innate capacity to heal itself with the help of the inner healer, the immune system. Placebo effect, the faith in the doctors’ kind words, is shown to have more power to heal than all the drugs and surgery put together (Sci Transl Med 16 February 2011; 3: 70). All potential patients should keep all these in mind when going for treatment. When you are healthy do not go for a check-up. The latter will for sure change your label from man/woman to a patient which might not change for ever. Beware! I salute Dr BM for his wisdom. His advice is invaluable to millions of people who are constantly vulnerable to misguidance by greedy corporate hospitals. I hope younger generation medical professionals heed his call. Thank You Dr. Hegde for enlightening the lay man with this informative article. This is an advice which one should follow all one's life and share it with one and all. The best part was " When you are healthy don't go for a check-up ...". Thank you Dr. Hegde. Yes as a lay person I agree fear of the unknown pushes many of us to the operation theater especially when the doctor informs us after reading our report about the frailty of our fragile heart. We need many more doctors who are bold to say live life normally and fully and stop fearing of the unknown when you have small ailments as all will die someday. See how animals heal. While I agree that over-diagnosis and over-treatment should be avoided, this article gives very little information to lay public on how to determine when a certain diagnostic test or treatment is excessive. Statements such as: "...With new physics we now know that the human mind is the human body. Our creating anxiety with a serious diagnosis is capable of advancing the death significantly..." and "...Placebo effect, the faith in the doctors’ kind words, is shown to have more power to heal than all the drugs and surgery put together..." will only serve to confuse the lay public to avoid even essential diagnostics. There is no denying that, over the last three decades, diagnostics technology has come a long way to save thousands of lives which would have otherwise been lost. However, the real malady is in misuse of technology for personal gains by a large section of medical professionals. The answer to this is not to avoid diagnostics or to create a fear psychosis of diagnostic tests, but to find solutions that will defeat the greedy nexus between doctors and diagnostic labs. In this context, I would like to recommend two approaches for long-term benefit to patients without creating an agnosis to diagnosis. All readers are advised rightly to understand the contents of this article, lifelong. Its surely will be healthy for self and your dear ones. The medical fraternity needs to see patients as such and not the one with lot of patience for all their acts, omissions and commissions. Health insurance business aggravated these issues to the advantage of the insurers and medical fraternity. The first doctor-patient in New York has created headlines the world over. He did not follow his quarantine rules properly and travelled in the subway while incubating the disease. It will be tough to find out exactly who he may have come in contact with. There is now some suspicion that Ebola might even be transmitted through air! That is quite scary. India must get ready to face the threat anytime now. A look at the ubiquitous cold viruses teaches us many important lessons. While they proliferate in the nose, they induce sneezing which is the easiest way to spread the virus to new victims. However, the virus takes care to see that it does not make the patient unfit to go about his/her daily work thus gaining access to more victims. This is how nature works for every living organism. They try to survive even under hostile conditions. Areport originating from the Rotary International claimed that India is, finally, polio free. I was happy, as any sane person should be. However, I was intrigued about the fact that the report emanated from a so-called service organisation. Do they really know the intricacies of this statement? 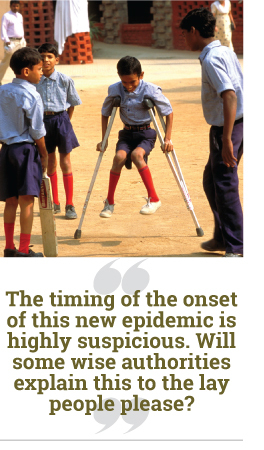 Ever since we started vaccinating every child in India, even those with severe malnutrition, a new disease has come to the fore, the ‘non-polio paralytic disease’. The hapless children who have contracted this disease are paralysed for life. I wonder if the new disease has been properly investigated with viral fingerprinting, to rule out the vaccine virus having mutated in the gut of malnourished kids. The timing of the onset of this new epidemic is highly suspicious. Will some wise authorities explain this to the lay people please? I had written a book on hypertension in 1993 in which I had stated that blood pressure counts of only above 100/60 need to be considered for drug treatment. I had mentioned that the lower cut-off points were engineered by drug companies to increase their profits. I was criticised about this by many at that time. Now, the Cochrane group says the same thing with the cut-off point at 159/99! Co-author of this Cochrane review, James M Wright, MD, PhD, physician, researcher, pharmacologist and professor at the University of British Columbia (Vancouver) had this to say on the subject. “The blood pressure should not be reduced below 140/90 and reducing to lower levels might be associated with dangerous side-effects. The drugs should be started only after the level reaches 159/99.” He now asks his patients to reduce drugs that they are on and even goes to the extent of asking them to gradually stop drugs if they have reached 140/90 and have a healthy lifestyle. These were the very sentences in my 1993 book! What made me happy is that Professor Wright feels that thiazide diuretics are the only safe anti-BP drugs—another one of the statements in my book. I have again learnt, to my dismay, that one should not be ahead of one’s time! Atherosclerosis is a chronic illness leading to gradual obstruction of various blood vessels in the body. For those who are genetically predisposed to develop atherosclerosis, this could start as early as in the first decade of life. This was shown in the post-mortem aorta obtained from African-American children killed in the crossfire during the Los Angles riots. Advanced coronary artery blocks, in all the three major epicardial vessels, were observed to have profuse collateral connections in a sizeable number of young soldiers shot dead during the Korean and the Vietnam Wars. The post-mortem angiograms in these 205 soldiers showed significant obstruction to the coronary vessels in the majority. They could easily have qualified for bypass grafting in the commercial cardiological world. This goes to show that atherosclerotic blocks do not start after the fourth decade of life to produce various vascular accidents. Although time evolution in a dynamic organism, like the human body which is continuously fuelled by food and oxygen, depends on the total initial knowledge of the organism's body characteristics, like body mass index, serum cholesterol, blood pressure, blood sugar, etc, it might not validate future predictions. To complicate matters further, doctors do not, and can not, understand the total initial state of any human being with the tools at their disposal to acquire such knowledge. Quantum physics, having realised the importance of the human mind in understanding the subatomic world, now places great emphasis on the importance of mind over matter in the affairs of the universe. A similar trend is needed in medicine too. The new science of chaos looks at man as a whole, mind included. More and more studies in the medical field now point to the fact that human behaviour, human emotions, psychosocial factors and inter-personal relations have a larger impact in bringing about diseases ranging from common cold to cancer. There have been studies of students’ hostile behaviour vis-à-vis the atherosclerotic process in their coronary vessels. These clearly indicated that the process of atherosclerosis has a direct bearing on the hostility score even in students as young as 15 to 20 years. When it comes to vascular accidents, be it a stroke, heart-attack or a peripheral vessel block, the obstructions to the vessels are not as important as the role played by instantaneous blood clots totally blocking the vessel lumen. Even under these circumstances, all the known risk factors pale into insignificance, compared to the emotional and psychosocial factors. Hostility, anger, depression, hatred and lack of social support came up as independent risk factors in the studies. Conventional risk factors like cholesterol, high blood pressure, diabetes and smoking did not have a major say in the final assault. An important area of research in the latter field has been job stress. Suffice it to say that the human mind plays a pivotal role in initiating and modulating atherosclerosis on a long-term basis; in addition, the mind brings on the final clot at the final moment of assault. With the government funds dying up for research even in the advanced West, drug companies and instrument manufacturers are the ones that primarily fund medical research. There are only two ongoing randomised trials under way in this area. While the first-ever ‘Diet-Heart Study’ in Framingham, having spent $110 million of tax payers’ money, came up with a negative result, showing no relationship between the diet and heart disease at the end of five years, the ‘heart-food’ industry in America, which had by then invested billions of dollars in producing ‘heart-healthy food’, saw to it that the ‘Diet-Heart Study’ results were never published. Big business made billions of dollars of profit by selling cholesterol lowering drugs. Amazing. Stress is a form of terrorism that infiltrates and attacks our hearts and minds and the effectiveness of our organizations. The situation in which body arteries get hardened or narrowed by the excessive buildup of plaque is called as Atherosclerosis. Lifestyle changes as well as proper medication is must required to out away Atherosclerosis. At Full of Health, we provide natural, but very effective remedies for Atherosclerosis. You can visit our website http://full-health.com/ to gain more knowledge about Atherosclerosis.